Thursday, February 28th from 5:45- 7:00 P.M.
Come Join us for a fun- filled evening of learning. You and your child will participate in activities and experiments focused on Science, Technology, Engineering and Math. Light snacks will be served in the cafeteria beginning at 5:45. S.T.E.M activities begin at 6:00 in the gym. Even though it was a sunny day today, we still have multiple roads that are completely impassable or affected by high water. As such, Rutherford County Schools will remain closed on Monday, Feb. 25, 2019. Again, all Rutherford County Schools will be closed Monday, Feb. 25, 2019. Rutherford County Schools and we want to let you know the plan for Friday. The latest forecast shows our county will receive several inches of rain overnight and throughout Friday, which is expected to compound the flooding and road issues. As such, all Rutherford County Schools will remain closed on Friday, Feb. 22, 2019. Again, all Rutherford County Schools will be closed Friday, Feb. 22, 2019. Thanks again for all that you do and have a good evening. 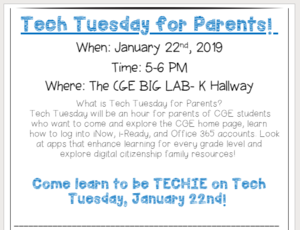 Tech Tuesday will be an hour for parents of CGE students who want to come and explore the CGE home page, learn how to log into iNow, i-Ready, and Office 365 accounts. Look at apps that enhance learning for every grade level and explore digital citizenship family resources! Parents of third, fourth and fifth grade students please join us for our Parent training coming up on November 14th. We are thrilled to have Lisa Kegler, Rutherford County’s Elementary English Language Arts Instructional Specialist here to present. We will learn about effective reading strategies and tools that can help your student learn and excel. Parents who attend will be able to choose a text from a variety of non-fiction books to take home and practice these tools and strategies with students. Please R.S.V.P. so that we can plan for your attendance. Please return the form to your child's teacher by Friday, November 9th. Parent Workshop for ESL Parents: ¡Yo No Hablo Inglés! ¿Cómo puedo ayudar a mi hijo en casa? Join us on Friday Oct. 26th from 5:30- 8:00 for CGE's Annual FALL FESTIVAL! There will be many great activities for all ages!